Oh, right. Happy New Year. Merry Christmas, Happy New Year, あけましておめでとう、etc. I hope everyone had a good holiday season, and that if you lost power (like I did), it wasn’t out for too long. I have a few posts percolating (including a review of the hilarious Wreck-It Ralph), but I’ve been “busy” (those video games I got for Christmas and during last semester aren’t going to play themselves (if you import gamers were curious, Tales of Xillia 2 is pretty good), nor are the case surveys I’m doing for the law review going to write themselves!). Also, I have finally read Cold Days. Jim Butcher is my master now. Ghost Story, while good, was a bit sedate for the series, and Cold Days returns to the nonstop action and wham lines. Hopefully Butcher will be back to his ~1 year per book schedule, instead of the almost 1.5 year per book he’s taken for the last two. Next on the pile is Iain M. Banks’s Consider Phlebas, the first in his SF series on The Culture. I may have to start sleeping even less. Nearly two years ago, I posted an overly long and verbose piece on why, despite my preference for region-free consoles and gaming, consumers don’t have the right to region-free games. This was mainly in response to Nintendo’s decision to region-lock the 3DS. Early this morning, through what I can only assume was the use of the necromantic arts, someone responded to that post. Because my response to that comment would have been far longer than a comment has any right to be, I chose to respond in a new post. Consider this a sequel to that original post. In the two years since my original post, Nintendo launched the 3DS (region-locked), and then had to drop the price because it was too expensive and no one was buying it. I still have not bought one (the last Nintendo console I bought was the DS Lite–I haven’t bought a Wii and have no plans to buy a Wii U), though I have bought a PS3 and PS Vita in the meantime (both of which, you will notice, can at the very least play out-of-region physical games). Sony has made choices with which I agree, and to support those choices, I am willing to pay for their consoles and games (and I have games for both systems from both the US and Japan). Nintendo has continued to region-lock their consoles and games. The prices of those consoles and games have not dropped to the point where I would be willing to forego the ability to play games from all regions on one console, so I have not bought them (even though I would dearly love to play Tales of the Abyss with load times that aren’t measured in geologic time, and Project X Zone looks ridiculous enough to be awesome). And Nintendo doesn’t owe you anything? You are a customer. Neither Nintendo nor their shareholders would make ANY money without the customers. They sure as hell owe you. And what you get for your money is that they patronize you and severely restrict your freedom. It is not okay. And telling people not to buy the system because of that is just stupid. It is not a solution. It was not the game developers’ choice to make games region locked. In response, I would like to point out that Nintendo does not owe me anything. I bought a DS Lite. Nintendo fulfilled its side of the bargain bye delivering what was promised–a region-free handheld gaming system. Since then, I have not been a Nintendo customer–I haven’t bought anything because I don’t want to pay them to restrict my gaming options. If you buy a 3DS/Wii/Wii U knowing that it’s region-locked, Nintendo still doesn’t owe you–you’re still getting exactly what you paid for. I don’t owe support to game companies. Game companies don’t owe me good games, bad games, mediocre games, region-free games, or region-locked games. If a game company has a game I want to play, I buy it, and the relationship ends there. Not buying the system because it’s region-locked is not only the solution, it’s the cheapest solution (it’s certainly cheaper than trying to get a big enough block of Nintendo stock to control the company’s decisions). If you’re not willing to give up the ability to play the games that come out despite the region-locking that Nintendo has foisted upon consumers, then you’ve made an economic decision that region-free gaming is not worth as much to you as it is to someone who chooses not to buy a Nintendo console because of the region-locking. Nintendo is free to choose to region-lock their consoles and games. Sony is free to choose not to region-lock their consoles and games. And the consumer is free to vote with his wallet and support whichever philosophy he agrees with, if he even cares. Sadly, I suspect most consumers don’t care about whether or not their consoles are region-locked. 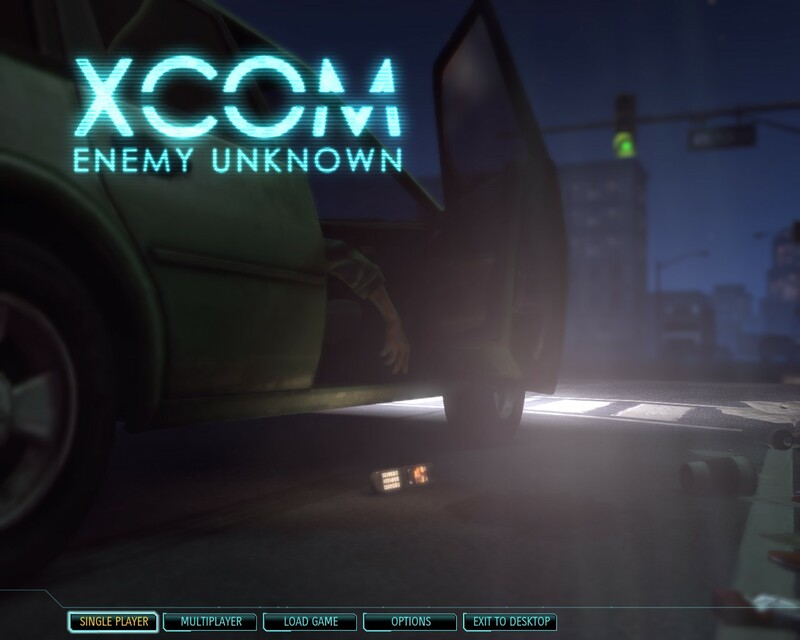 I’m about ready to wrap up my first* playthrough of XCOM: Enemy Unknown, and you’ll be happy to know that Earth has been saved from the alien menace. The red armor is three times faster than the usual armor. The strategic layer is more streamlined, too. I would have preferred being able to have multiple available teams (if you build multiple Skyrangers) so that you don’t have to choose between missions. More UFO attacks wouldn’t hurt, either. As the game progresses, it seems like you do a lot of waiting at the geoscape for something to happen (whether it’s an abduction, a terror mission, a council mission, or a UFO). 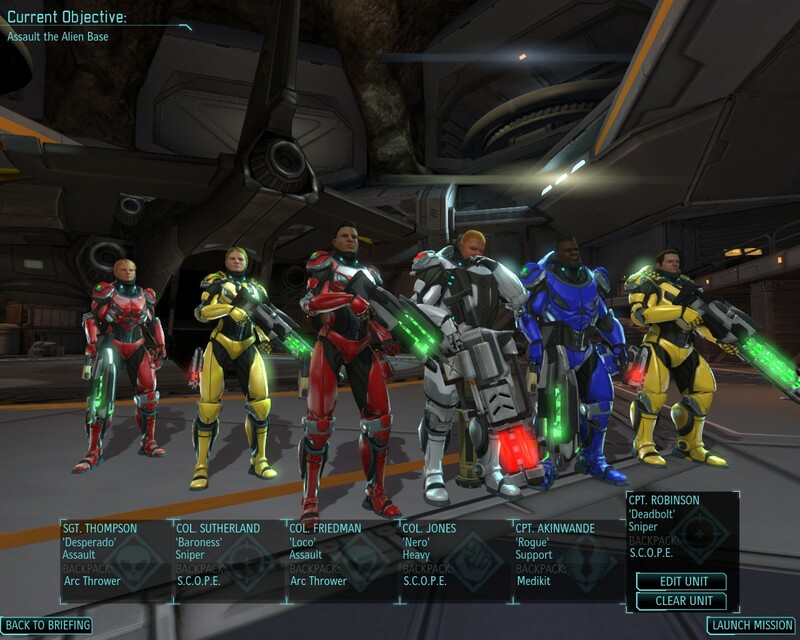 In the original X-COM, the longer the game went on, the more frequent the UFO attacks became, until you ended up getting overwhelmed. I know 1994 was a different gaming era, but I think that really added to the tension. Taken as a whole, the updates are generally good. The game is still hard, the aliens are still unforgiving, and your soldiers still die heroic (and sometimes, unheroic) deaths. I’ll probably play Classic next, and then I might even give Impossible a try. 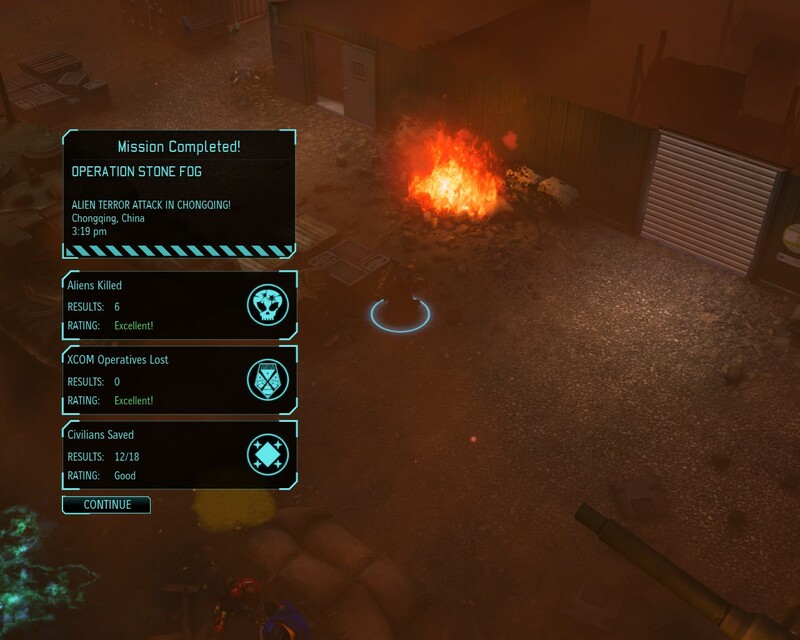 I let a third of the civilians die and it rates my performance as “Good.” Yeah, this is X-COM. You know, when I have copious free time (which means I can pencil it in for December, I guess). *For certain values of “first.” I restarted my Classic difficulty Ironman game several times while trying and failing to get a grip on the changed systems, before finally caving in and dropping the difficulty back to Normal (though still Ironman). **Which played a lot like Sakura Taisen, which in turn played a lot like X-COM: UFO Defense. The circle is now complete! ***Yes, I know Wolfgang Krauser is an SNK character. It seemed like most of the random soldiers I got ended up being German with random German names, and this was all I could think of. I’ll post my review of Taken 2, and the post that would have been here but for my hunch that I’d say something I might regret, this weekend. It hits Oct. 9, which was probably old news to you if you cared. The PC “demo” is up on Steam. It’s actually the tutorial, and is on rails for the first mission and part of the second. You do get to experience enough of the game for it to give off that X-COM vibe, though, and I’ll definitely cash in gift certificates and various reward points to get it at launch. Firaxis gave Game Trailers a new gameplay video, this time of a downed UFO mission. Unlike the other videos they’ve shown, this one is not in an urban environment. Monolith Soft released the opening movie to Project X-Zone, their Super Robot Wars-esque mashup of SEGA, Capcom, and Namco characters. I would be all over this game if (1) I had a 3DS, and (2) Nintendo hadn’t made the 3DS region free. The licensing problems a game like this would cause pretty much nixes any chance of its release in the US. Falcom is porting Trails in the Sky to PS3. I’m sure it will look great (since the original game was on the PC and supported high monitor resolutions), but I don’t know how many people in Japan are going to be willing to pay again for a game they’ve already bought once or twice before (PC, PSP, and now PS3). The Square-Enix business model focused on rereleasing your good old games to fund your crap new games will only get you so far. Ufotable’s animation for Tales of Xillia 2 is just as good as everything else I’ve seen them animate. This preview video also has portions of Ayumi Hamasaki’s theme for the game. Using his own logic, I could have the UN Secretary General shut up for “[humiliating] my values and beliefs” (i.e., free speech). The answer to bad speech is more speech. The idea that people or groups do not have any agency and are forced to dance to the whim of the speaker is reprehensible. In the same vein, Posner** is a big fan of the heckler’s veto. *No, not that SF MMO Lord British tried to make. It’s close enough to “tab clearing” for government work. **No, not that Posner (though it is his son). Growlanser IV is out for the PSP in the US (if you’ve a PS3, you can download it there and transfer it to the PS Vita without issue; if you’re PS3-less, you’ll have to wait until it’s up in the PS Vita PSN store). It’s pretty good so far; the sprites are nice, and the gameplay is classic Growlanser (JRPG-like with a heavy dose of strategy). As far as the Chick-fil-a brouhaha goes, I didn’t eat there on Wednesday. Not because I disagree with their position (which I do (disagree, I mean)), and not out of support for the attempt to crack down on speech Boston/Chicago politicians disagree with, but because the local CFA had cops out directing traffic, a drive-thru line that looked to be at least 50 cars long, and an in-store line that stretched around the building at least once. Their chicken is good, and I support their rights to hold positions I don’t agree with and be free from government harassment because of that speech, but it’s not stand-in-line-for-more-than-an-hour good. Linoge disagreed, and went on – in his characteristic way – to say in ~400 words what a normal man would say in 50 (I would have posted on this on the 1st, but when I got home, Linoge had already said basically everything I was going to. Even if he did say it in 4x the space). Want to eat sushi at the Olympics? Hope you don’t like soy sauce, cause mini packets are banned on account of not sponsoring the Olympics (beware; Sankaku Complex is about as unsafe for work as it gets). Between that and the lack of business the Olympics was supposed to bring in, I don’t know why anyone would voluntarily pay for the games. Other than as an opportunity to fleece the taxpayer and enrich politicians and their cronies, I mean. The latest live-action Rurouni Kenshin trailer is out, and it’s got English subtitles. My only complaint is that they translate Kenshin’s reference to his reverse-bladed-sword as merely “sword;” in Japanese, it’s literally written 逆刃刀; the first character means “backwards,” the second “blade,” and the third “sword.” Instead of being sharpened along the front edge and dull along the back, Kenshin’s is dull along the front and sharp along the back (reverse-bladed). It’s kind of a big part of the character, and just calling it a sword doesn’t really cut it (heh). In my less copious than normal free time (when not playing Growlanser (and sometimes while playing Growlanser), I’ve been rewatching The Good Guys on Netflix streaming. It takes me back to a more innocent time, when I hadn’t had a class on pre-trial criminal procedure, and was ignorant of how much of a free hand the courts have given police. I’ve mentioned it before; every episode is essentially an 80s/90s style buddy cop movie (in 45 min.). I’m also working my way through Simon R. Green‘s books. Again. Sure, they’re pulp, but they’re entertaining. And isn’t that what really matters? The law review has handed down the first cite check for this year; it’s due a week from Wednesday. Between that and the Legal Editing & Scholarship class I’m taking before fall classes start up, I’m being kept off the streets pretty efficiently. One of these things is not the same. I should point out that the region-free list* after the jump (since it’s a pretty long list) is not exhaustive. The PS3 has been region-free since its launch six years ago (with one slight scare with Stranglehold before it was released without a region lock). And yes, I am mocking ATLUS. Mercilessly**. They deserve it for reviving the (supposedly) dead spectre of region locks on PlayStation console games. Namco’s next Tales of game is Tales of Xillia 2! I wasn’t expecting this at all (since only a few of the Tales of franchise have had actual sequels), and now I’m really looking forward to it. There’s a Kickstarter page up for a new Tex Murphy adventure game! The only one in the series I played was The Pandora Directive, but it was pretty good (in spite of a few esoteric puzzles). Good Old Games has the Ultima and Wing Commander games on sale (for another 6 hours) at half off. I played so much Wing Commander II back in the day. I had such a blast shooting down Kzinti Orions Catians Kilrathi. Once I had the computer properly configured, anyway (which was never trivial with Origin games). I’m still pretty pressed for time (though it’s not as bad as I thought, since the law review write-on ends next Monday and not this Friday (like I originally thought)). Hopefully things will clear up by next week. After turning in my paper for my legal writing class this morning, and my civil procedure midterm this afternoon, I’m exhausted. Who knew retraining your brain from a technical/engineering bent to a legal bent was such hard work? Anyway, Tales of Graces f releases today in the US; my impressions from last January of the Japanese release are just as relevant now as when I wrote them. If you’re on the fence, but you liked Vesperia or Symphonia, give Graces f a chance; the story is a bit cheesy, but it’s worth dealing with because the battle system is so good. XSEED Games announced the news that they’re bringing Ys: The Oath in Felghana and Ys Origin to Valve’s Steam PC gaming platform; the former will hit the store next week for $15, and the latter at some future date for some unannounced price. My post the other day about Ys Origin got me more interested in playing that game, and I had considered finding a store online that I could import a copy of the Japanese PC release from. Now I can just wait! And finally, Joe Huffman found this great infographic detailing all the ways in which the TSA wastes our money, invades our privacy, and does both of those without even stopping terrorists.